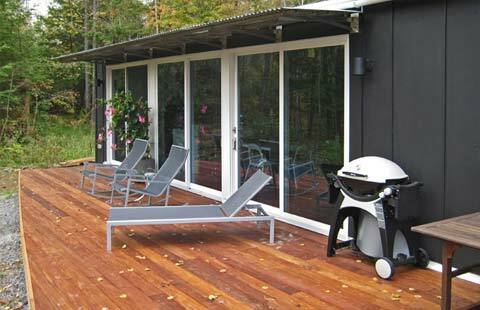 Bill and Mary Griffith decided it was time to move out of their Dutch Colonial home and into their new weeHouse – a charming country prefab house, bordered by a stream on a quiet wooded lot in Cobleskill, NY. We started four years ago. We lived in a two family Dutch Colonial house on Main St. of Cobleskill, NY. It was getting time to move to the country for peace and quiet and for the privacy of our own home. We searched for land for nearly a year. We found the property of our dreams bordered by a stream, nearly all wooded, on a quiet country road. We started to think seriously abt. what type of house to build. We knew we wanted small. our apt. was only 900 sq. feet, but we wanted a house that had good quality and some flair and uniqueness. What inspired you to get involved with a prefab home? Because we worked with Alchemy Architects we could get a beautiful and unique house that we could afford. We are not rich, but we were able to afford a house we love because it is prefab. 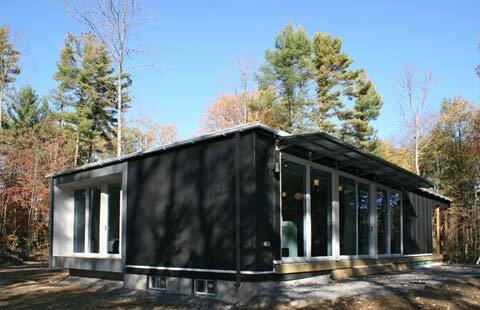 Are there any prominent features or benefits to living in a prefab? Are there any weak points you can think of to a prefabricated house? 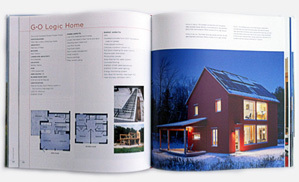 Can you tell us what made you choose Alchemy Architects? They were creative, understanding, and have incredible integrity. They stand behind everything they do. The relationship was great. We were our own general contractors so as to save money and Alchemy was patient answering our questions and helping us through a process that was very involved. (We liked being so involved. It was very satisfying to be part of the process.) By the way, we worked with Scott Erwin. Scott came to the house set and then spent three days helping us paint, helping us put up the awning, directing the electrician and plumber, and many other things. He was simply amazing. He even helped with what color to paint the exterior and he helped my wife with furniture choices. Let’s talk about the design & construction stages – Can you tell us about the process? 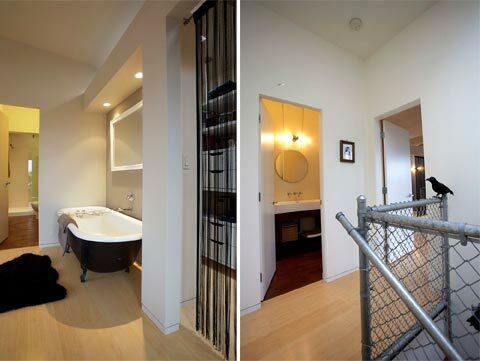 The design is described well at the Alchemy site, from price to design. It really is simple. 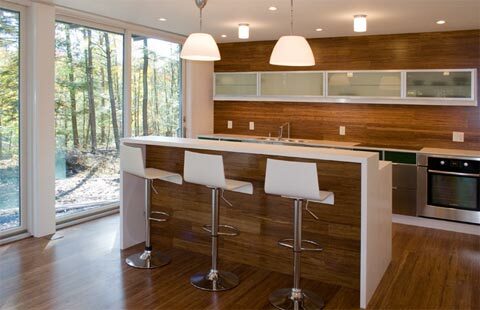 Can you tell us about the type of construction and materials you have chosen for your prefab and why? We made choices from those that were available because we liked the colors. We got in floor radiant heat because it is nicer than forced hot air. But since we moved in we haven’t turned on the heat. We heat with wood that we cut on our land. The roof is rubber and appears flat. Since we’ve moved in we have had solar and PV installed on the roof. We have an unfinished basement that is walk in. 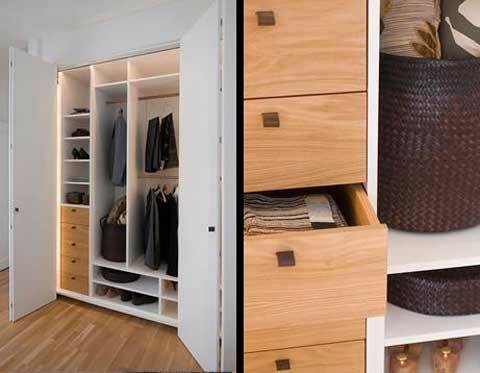 It is such a great place for storage and projects. We store our canoes down there. Oh, I forgot. My wife wanted three things: a screened in porch, an entryway, and a utility sink. The sink is downstairs in the cellar, the entryway has built in closets and tile floor, and the porch is right off the living room with ipe flooring and a fan. It is her favorite spot in the summer, spring and fall. Very, the house is small, the bamboo floor is sustainably harvested, we heat with wood I cut on our land, we have solar electric and water. 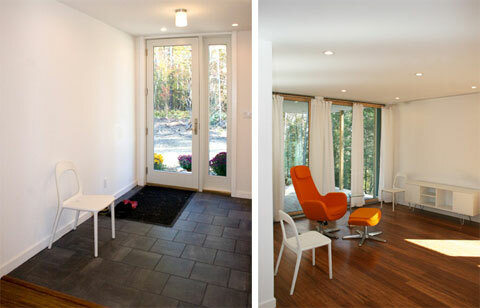 In your experience, is there any difference living in a prefab compared to a conventional house? In terms of green living, practicing sustainability, etc. 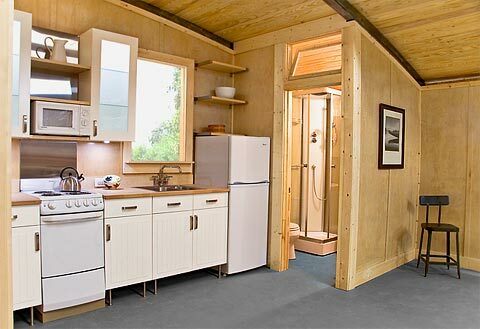 I think there is less waste in prefab construction. In your opinion, is the affordability of prefabricated homes a bit exaggerated or do you think prefab is the solution to low cost housing? Our house is small and affordable for us, but it would be expensive for many in our county. What would you consider to be the most challenging point in the project? Making the choice to finally “take the plunge”. Once we decided on Wee house we were happy and enjoyed the process and love our house. 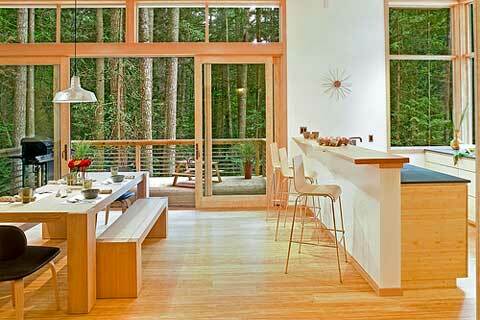 What advice would you give to a potential homeowner interested in a prefab home? Work with people you trust, if you think there is something you want in your house, try hard to figure it out. We have NO regrets about our house and the process. 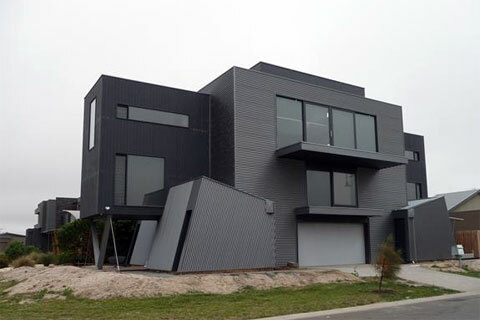 What’s the companies name that fabricate these houses? Hi… Is there a brochure/price guide for this please? Is it available in UK?